The race to replace Speaker Joe Straus is the talk of the Texas House, but it's just the most visible part of a power shift that affects every state representative's standing. TMF is back, proving that not everything in a race for speaker of the Texas House is about who’s going to be the next speaker of the Texas House. The TMF in this instance is Trey Martinez Fischer, a bull of a Democratic House member from San Antonio who gave up his seat to run — unsuccessfully — for the Texas Senate and is now poised to return to his old stomping grounds. Known around the Capitol by his initials, he was one of the leaders of the Democrats before he left. Others stepped up and could reasonably expect to keep going even though he’s back. That might be what happens. But TMF, never a shrinking violet, sent a letter last week to some of the real and suspected candidates for speaker, urging them to show their faces, to start a dialogue over the direction of the House — to come out and play. Maybe this is a style thing among partisans, but his email to a few dozen select members of the House was addressed to 16 Republicans, with 21 Democrats included in the Cc: address field. A race for speaker is just the tip of an iceberg that most Texans and even a lot of people in state government ignore. That top race has all the thrills of politics — high stakes, interesting personalities, money, drama, partisanship. It’s the stuff popcorn was made for. But it is just the visible part of a real shift in power — a shift that currently animates the speaker race but will, after that, impact the actions of the entire House. The day after the 150 House members choose a speaker, that new leader starts “organizing” the House. In plain language, that means he wants to talk about rules, committees and about the ongoing interactions — lately, somewhat bumpy interactions — between the House and the rest of the state government. Whether he turns out to be in the middle of things or not, “organizing” is a very gentle word for what happens in the Texas House when leadership changes. The day after a speaker is elected, all of the state’s representatives become supplicants, hoping the new boss will favor them when putting together House committees and deciding who’ll get to run them. The politics before the election, for that and other reasons, are fraught. Landing on the wrong side in a leadership contest could mean years out of power. The hero-to-goat-to-hero rollercoaster is fast and unforgiving in politics. Republicans have the majority in the House and will still have it after the elections, barring an extraordinary turn in public opinion. Still, Democrats like TMF could be the most powerful bloc in the speaker race and in the House next year. The Republicans have a majority, but they’re split into factions. 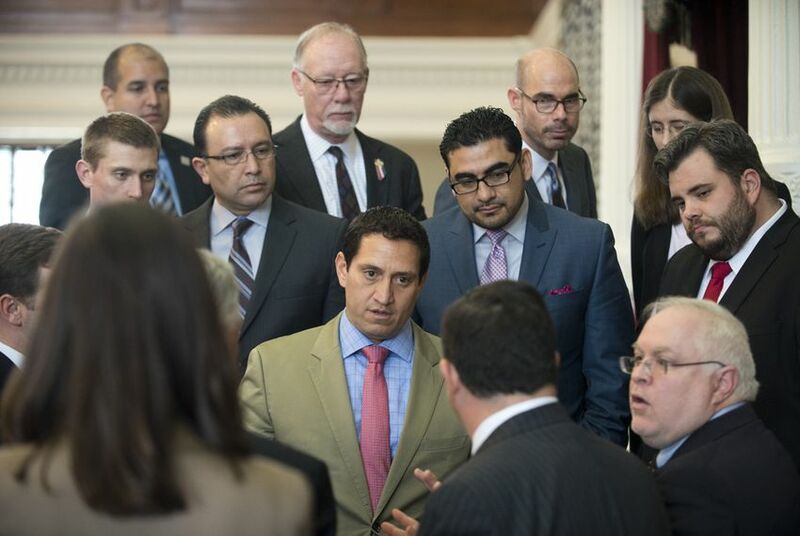 They’ve talked about getting together behind a speaker and voting as a bloc, but the Texas Legislature, for all its battles, is less partisan than Congress. Being in the minority party means fewer choice assignments — but it’s not a winning-party-take-all system like Washington. It’s possible to become speaker of the Texas House without any Democratic votes, but it’s unlikely. TMF might or might not be the Democrat the speaker candidates seek out, but this is certain: They’re talking to Democrats, and he and everyone else is getting into position for new alignments of power not just at the top but throughout the Texas House of Representatives.